Is this Snuba Diving in Bermuda? The helmet is placed on your shoulders and is held as you descend, so you never feel its full weight. Snuba diving is supposed to be a bridge between snorkeling and Scuba diving. However, it is a chimera that has all the disadvantage of scuba diving, and all the limitations of helmet diving, with none of the advantages of either. With scuba and snuba diving you wear a mask, rather than a roomy helmet. Therefore beards can be tricky and glasses are out. Unlike helmet diving, both snuba and scuba diving requires you to know how to swim. 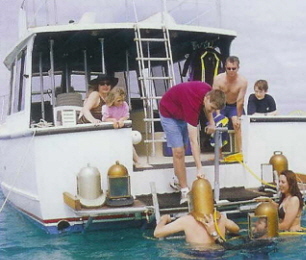 Both snuba and helmet diving are limited by a hose, but not scuba divers. With both snuba and scuba diving, your dry air comes from a tank which can lead to minor discomfort in the airways. Because you are breathing through a tube in your mouth, you become more aware of having to breathe. This causes the novice diver to use up their air too quickly and cut short their undersea adventure. Helmet diving has regular surface air without end, that you generally breathe through your nose. This automatically humidifies the air and avoids the dry throat situation. Both scuba and scuba diving involve oral intrusion. Therefore, lip reading, mouthing words, even smiling to others becomes very hard. This is one of the reasons that special scuba hand signals become vital to safety and communication. This is one of the reasons helmet diving inherently safer, easier and therefore more enjoyable. Snorkeling, snuba diving and scuba diving are only different methods of getting underwater. Your purpose, why you are underwater, is far more important. Our purpose is to create fun by getting the fish to be near us and interact. This requires making friends with food. There as a snuba operation here run by Fantasea diving. As it is run by scuba divers, nice ones I will add, they are conditioned by the mind-set of their training and are discouraged from making friends with sea creatures. They may scatter food to create a buzz, but this mob behavior does not lead to having trusting, relationships with individual creatures. In fact, mindless fish feeding can lead some fish, especially at popular snorkeling spots, to nip humans in an effort to prompt them into dishing out the food. They will be bold, but not friendly. If you reach out to touch them, they will swim away. On the other hand, some of our fishy friends allow them selves to be touched or held. Many will pose in your photos. Think outside the box!